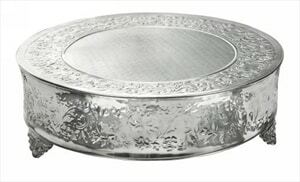 This is a beautiful silver round cake stand great for weddings, anniversaries, or any other celebration where you have a cake to serve. The top of this stand measures 18″ across and is ” tall. SKU: PCC12. Categories: Miscellaneous Wedding, Trays, Party & Event, Serving Equipment, Wedding. Tags: round cake stand, silver cake tray, wedding cake stand, silver cake stand. This is a 6″ plate which can also be used as a dessert plate. All dishes come to you you clean and ready to use. All that we ask of you before return is that you rinse the dishes and return them in the crate or box in which it came to you. This is a great serving piece typically used for cupcakes or desserts and can be used to save table space. The tiers measure 6″, 10″, 14″, 18″, & 22″ respectively and the entire tray will hold up to 150 cupcakes at at time, depending on cupcake size. This is a 7″ plate which can also be used as a dessert plate. All dishes come to you you clean and ready to use. All that we ask of you before return is that you rinse the dishes and return them in the crate or box in which it came to you. This cake fountain can help make any cake look a lot more festive! The center of this fountain lights up and adds a little fun elegance to any party. The top portion of this cake fountain, which holds the cake, measures 16″ across and the entire fountain is 15″ tall. This item requires a standard 110v power supply.